And here we are. The final leg of Arrest Us!. The big winners get their due. Before we get into those, we want to give a hearty thanks to the folks who helped make Arrest Us! so much fun. First, let's recognize the awesome publishers who sent out prize packs to our best reviewers. Each winner got a bunch of free books and other swag. Next up, we have the celebrity critiquers who graciously donated their time and talent to five contestants who won a free review of their submission. Finally, let's give a big thank you to the man who is providing the grand prize. Publication is the desired end result for every story, and earning a spot in a quality publication is the desire of every writer. 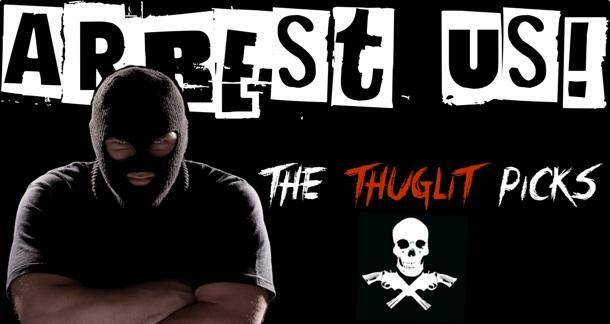 Thuglit is one such quality publication, and the editor, Todd Robinson, generously offered to read through the top-rated stories and pick three to run in the magazine. You all are writers; I don't need to explain how awesome of a prize publication is. After all, you're reading this to see who earned these spots. So let's just get to it, shall we? Each one of the selected stories will be highlighted in a separate issue of Thuglit. So one story will be featured in Issue 14 in November, followed by issues 15 and 16, due to be released in January and March. Todd will be in contact with the winners to sort out edits and pub dates. Keep your eyes peeled for these (don't worry, we'll remind you), and make sure you give these three a big hand for their incredible achievement. They've earned it. Alright, that's a wrap. I'm incredibly pleased that this contest went so well, and want to thank you guys for making this such an awesome experience. Make sure you let us know how it went, and provide any suggestions for future contests. Meanwhile, I'm being told I can have a five minute break, then I have to get back to my desk and start working on the next Big Thing. I have no idea what this Big Thing is; all I know is that there is a very large box with air holes on my desk, and it's growling at me. The word "Work" is written on it in orange crayon. So yeah, the fun never stops around here. See you all again very soon. Nice. Congrats to all the winners! Great competition. A hearty well done to the winners with only the slightest touch of envy. All well deserved. Congradulations to the winners, looking forward to seeing what competition is next.^^ Look forward to reading your work. Quickly dashes off to read the one I hadn't read before (Heart - too popular even from early on for my "hidden gem" search) - well done to the winners, all very highly rated stories. Enjoy seeing your work in print! It appears Maxwell wasn't involved with his silver one if cool tough guy Liam Sweeny's "THE WRONG HAMMER" pounded down the competition ... judged and prized by such swanky folks. Super Congrats to the wild wise man who drove me through the streets of Albany in last year's Bouchercon shadows. Likewise to Dan Fiore and Devin Robbins. I join gazillions of readers in anticipation ... wish Mr Nathan Scalia more breaks in his hot action . . . and naturally, tip my fedora to the Thug of all Lit -- Todd Robinson -- a gent I'll *clink* with at any authorly gathering. The Wrong Hammer? For real?!? That is freaking awesome! That was the first story I read and reviewed and was actually the reason I decided to even do the contest! I mean, obviously congratulations to the other two, I loved both of those stories (and seriously, anyone who didn't think Heart was getting published was out of their damn minds) but I am bizarrely psyched for The Wrong Hammer. That story was what was up. It was wicked cool, hella inspiring and Liam gave me a damn fine review. This announcement completes my Arrest Us experience in the most satisfying way. Well done, people. Well done. Congrats, gentlemen! All great stories!